An 50 min. presentation accompanied by an optional 50 min. workshop. Additional hands-on small group workshops also available. 'Straight Up Shakespeare' is an energetic, fast-paced romp through Shakespeare's world. A team of six MAW actors present a collection of famous scenes, speeches and sonnets. The performance is accompanied by a 45 minute workshop that explores one or two individual scenes and the actor/audience relationship. * Highlighting scenes from most taught texts such as Romeo & Juliet, MacBeth, Othello and Midsummer Night's Dream. * Drawing immediate and personal connections to the power of language. 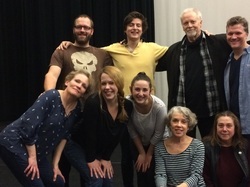 "I really enjoyed the play and loved that we had the opportunity to be part of the workshop. I liked when the actors were talking about what they think the feelings are behind each part of the scenes. The whole experience really broadened my understanding of Shakespeare and what he was trying to convey through his plays. I now know more about them and can relate to the emotions behind them. Overall, I loved the play and the workshop was a lot of fun. I would even consider seeing the performance again given the opportunity." We have art everywhere. It’s easily accessible. Pick up any book. Google any artist. But, what MAW, THT, and MUHS has is unique and has blossomed into a wonderful long-term relationship. In my English classroom, I facilitate discussions to better uncover thematic threads and motif development, connotations of words and choice of diction. By nature of my own practice and training, I look at drama from an academic perspective and not an actor’s. MAW and THT have allowed a totally new lens and ways to ‘read’ literature for both the English faculty at MUHS and our students. 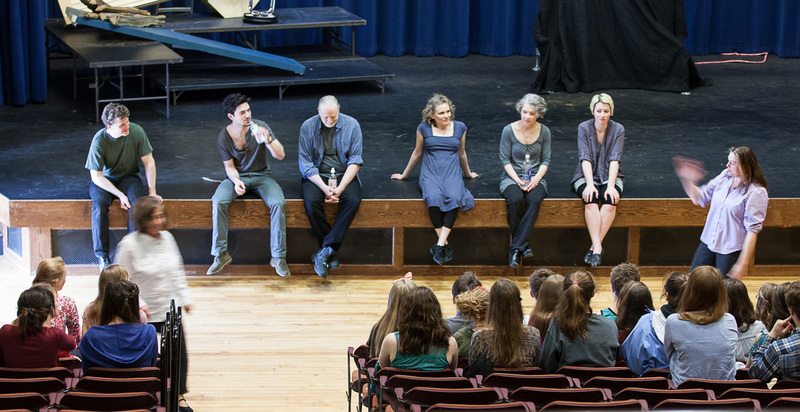 While we are still lucky to access the Middlebury Actors Workshop productions, our work transcends that traditionally one-dimensional experience of attending a production and folds students into conversations with actors and directors. They explore choices made in performance and what led to those decisions. In our workshops, actors rework scenes based on student input, using students as directors. Students have gained access and converse with professionals. that became to be known as “Straight Up Shakespeare,” Melissa and Lindsay invited multiple teachers to be equal participants at the table with them and the other actors at the very first production meeting and read-through. MAW’s and THT’s desire to have a shared vision of their work with local educators absolutely sets them on a pedestal and deserves the utmost accolades.